Greeting from Brussels! 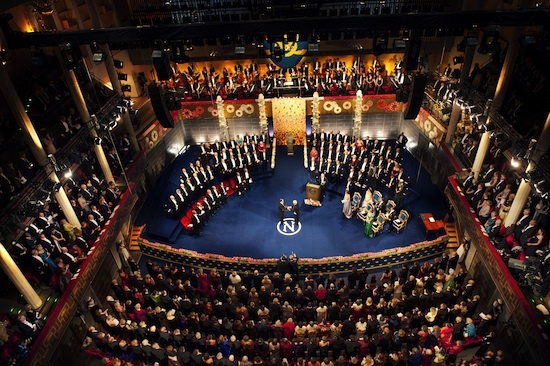 This is my liveblog of the Nobel Prize Announcement Ceremony, bringing you the facts and the retweets as they happen. I am glad to see that the Swedish Academy has recognized the importance of the mass-generating mechanism for gauge theories and the prediction of the Higgs boson, recently verified at CERN. My two collaborators, Gerald Guralnik and Carl Richard Hagen, and I contributed to that discovery, but our paper was unquestionably the last of the three to be published in Physical Review Letters in 1964 (though we naturally regard our treatment as the most thorough and complete) and it is therefore no surprise that the Swedish Academy felt unable to include us, constrained as they are by a self-imposed rule that the Prize cannot be shared by more than three people. My sincere congratulations go to the two Prize winners, François Englert and Peter Higgs. A sad omission from the list was Englert’s collaborator Robert Brout, now deceased. 13:14: I think my twitter account has exploded with tweets. Also, some Belgian news pages are down, probably due to high traffic. Wow! 13:11: Wow, what a great announcement. Too short though! 12:59: Animation of the boson appearing, cool! 12:57: We just opened the champagne here at ULB! 12:48: The award goes to Englert and Higgs! 12:44: One minute to go! 12:39: We all know what the Brout-Englert-Higgs mechanism is and what the boson discovery means, so let’s instead take a look at the other likely awards. The prize could go to the discovery of extra solar planets. 51 Pegasi b was an extra solar planet discovered in 1995, orbiting a sun-like star. This discovery could have far reaching implications. What would happen if we saw spectral lines suggesting the presence amino acids coming from the planet? (I’m not sure such a phenomenon is even possible, but if it is it would be a very strong indicator of RNA-like life from another planet.) That discovery took place 18 years ago, and the Brout-Englert-Higgs boson was discovered only one year ago. Either discovery would certainly be worthy of the prize. 12:29: Around the world people are patiently waiting. People from the US have been awake since 5:00am. In Marakech the ATLAS Collaboration looks on. Here are ULB/IIHE the cafeteria seem deserted. (I’m glad there’s a coffee machine on the desk next time mine.) I’m starting to think this is a plot to get some more media attention for what is bound to be a controversial year for physics. There are many good choices of topic this year, and even some of the topics have controversial choices of Laureates. 12:07: The announcement is delayed until 12:45 CET. People are complaining about the background music! 11:58: The announcement is delayed until 12:30 CET. 11:44: According to the Guardian (source) there will be a delay of 30 minutes. 11:42: Just over two minutes to go. This could be a very exciting year for Belgium. ‣ Hideo Hosono, for his discovery of iron-based superconductors. ‣ Geoffrey Marcy, Michel Mayor, and Didier Queloz, for their discoveries of extrasolar planets. There has also been speculation that either Anderson or Nambu may receive a second Nobel Prize for their work related to spontaneous symmetry breaking. With so many different predictions and so many opinions it can be hard to keep up with all the latest news and blogs! I know that a lot of people plan to share their views and experiences of the day, so I’ll be keep a list of bloggers and tweeters that you can follow. How to tell a Higgs from another boson? On July 4, when CERN announced “the observation of a new particle” and not the discovery of the Higgs boson, many wondered why be so cautious. It was simply too early to tell what kind of boson we had found. The Higgs boson is the last missing piece of the Standard Model of particle physics, a model that has enabled theorists to make extremely precise predictions. But to fully trust this model, it should have all its pieces. Who would want to complete a 5000-piece puzzle with the wrong piece? 1) Are all possible decay modes predicted by the Standard Model observed? 2) Is each observed decay happening at the right rate? 3) What are the fundamental properties of the new boson? The first checks (based on half the data now available) indicate that the new boson is compatible with being the Higgs boson. But the precision is still too low to tell as shown on the plots below (the signal strength and σ/σSM H are the same quantity). The Higgs boson can decay in many ways and the plot shows which decays have been observed and at what rates. A signal strength (of 1 means the signal corresponds exactly to what is expected for a Higgs boson. Zero would mean there is no signal seen for this particular decay channel. The black points represent the measured values and the horizontal bar, the error margin. At this point, we cannot tell unambiguously if the first two measurements are more compatible with 0 (the decay does not exist) or 1 (yes, it decays at the predicted rate). Both CMS and ATLAS need to analyze more data to say if the new boson decays into two b quarks (H → bb) and two tau leptons (H → ττ). The other three decay modes, namely WW, two photons (H → γγ) and ZZ occur at about the rate or slightly more often than expected by the Standard Model. The decisive test will come by measuring its spin and parity, two “quantum numbers” or properties of fundamental particles. The spin is similar to the angular momentum of a spinning object. But for fundamental particles, only discrete values can be used. For bosons (the particles carrying the various forces), these values can be 0, ±1, ±2 and so on. For fermions, the building blocks of matter like quarks and leptons (electron, muon, tau and neutrinos), it can only be +½ or -½.
Aidan Randle-Conde has compiled all possibilities on his blog. A particle with spin 1 cannot decay into two photons. Since we have seen the new boson decaying into photons, spin 1 is already ruled out in the table below. Moreover, a spin 2 boson could not decay into two taus, which is why it is so important to look for this decay in the latest data. The Standard Model predicts that the spin and parity of the Higgs boson will be 0+. To distinguish between 0+ and 0–, as well as 2+ and 2–, the only way is to carefully measure the angles at which all the decay products fly apart. So if we observe the new boson decaying into photons, we must measure the angle between the photons and the beam axis. If it decays into two Z, each one going into two electrons or two muons, we must carefully measure the angles of these four particles and their combined mass. 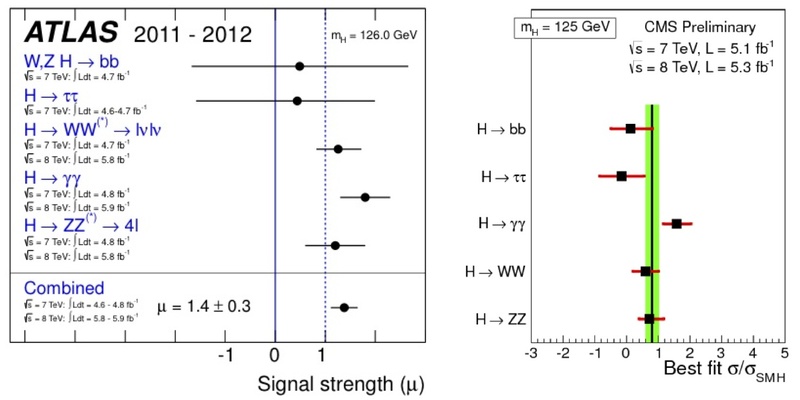 Here is what Sara Bolognesi and her colleagues predict for Higgs bosons decaying into ZZ, WW or two photons. We must measure specific quantities, namely the mass and angles of the decay products, to distinguish them. If they match the red curve, we will know it is the Higgs boson, but it they look like one of the other curves, it will mean the new boson corresponds to a different theoretical model. Each experiment now has about 14 fb-1 of data on tape and expects about 25 fb-1 in total by the end of the year. With the 5 fb-1 collected last year, it should be sufficient to unmask the new comer. “All” we need to do is measure these extremely complex quantities. For more info, see these two CERN news videos on CERN YouTube (part 1 and part 2) on the Higgs boson spin.